Powerful multi-wavelength laser module ML6600 - Modulight, Inc. Powerful multi-wavelength laser module ML6600 - Modulight, Inc.
ML6600 is a multi-channel laser module with a simple standard interface. ML6600 module can be ordered with 3 different wavelengths, conveniently within the same package, with combined fiber or individual fibers output. Alternatively, ML6600 can be used for power scaling, bringing 3 W output power from a single fiber in one wavelength (465, 532 or 635 nm). Talk to our engineers for solution customized to your needs. ML6600 laser system has pigtailed or receptacle laser output with 100-200 µm fiber. The control, cooling and driver are integrated, and the control supports both analog and digital modes. 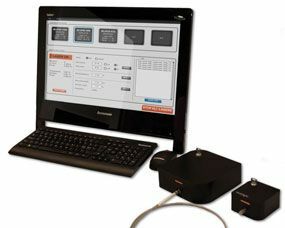 Pingback: Modulight broadens their OEM laser system family to single-mode and multi-wavelength laser modules - Modulight, Inc.